L'Oreal Extraordinary Clay Re-balancing Shampoo: I've never found that one shampoo that I consider to be a holy grail product. I have hair that is dry at the bottom and extremely oily at the roots so to find a shampoo that can combat both these problems proves to be a difficulty however this recent addition from L'Oreal just works absolute wonders. It contains hyluronic acid within the shampoo which makes that the ends of the hair stay moisturized until you next wash in and the clay within the shampoo also absorbs all the grease at the roots which just makes it idea. 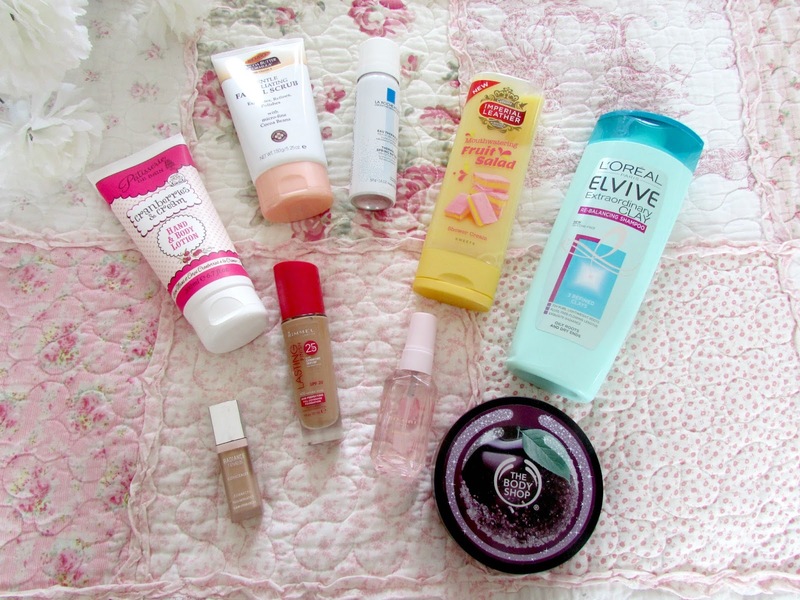 I did a full review of this shampoo and other products within this range that you can find HERE. Imperial Leather Fruit Salad Shower Gel: I go through shower gels like there is no tomorrow. 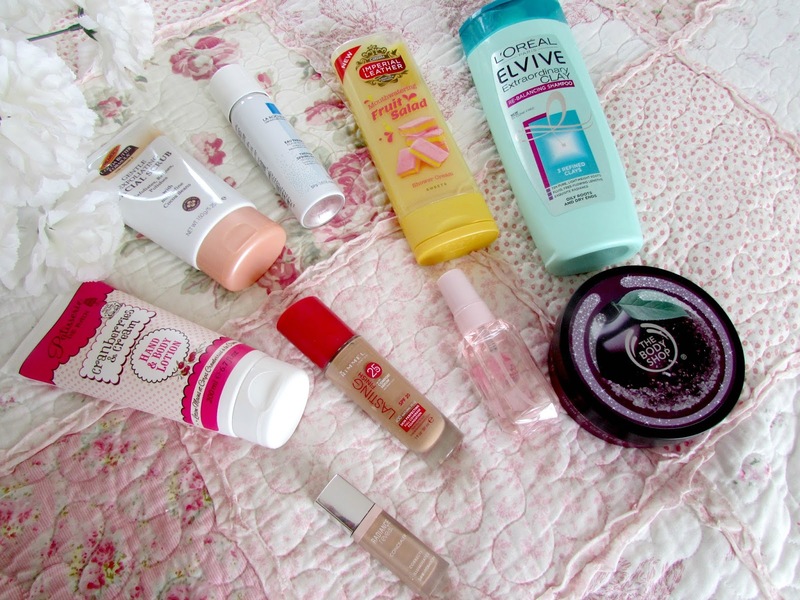 I love heading in to superdrug or boots and seeing what new ones I can try. I'm the type of person who absolutely loves the sweeter scents compared to fresh scents I don't know why but it's just what I'm like and I have to say this hasn't disappointed. It's really fruity and sweet and lathers up really well on the skin and really does leave it feeling extremely soft and smooth. Patisserie De Bain Cranberries and Cream Hand and Body Lotion: This came in a pack of two the other product being a shower gel and I absolutely love it. It was actually on special offer in Superdrug and I managed to get it free and I absolutely love it. I love the Patisserie De Bain products as they all smell absolutely amazing and really do leave my skin feeling soft and smelling absolutely divine. I'd highly recommend them. Rimmel Lasting Finish Skin Perfecting Foundation: This is my favorite foundation by far at the moment. I absolutely love it. I've received so many compliments since I've used this foundation. It's just amazing. I find it's quite heavy coverage but is super natural looking as well. It blends really well, smells amazing and leaves a really nice glow on your face. It also makes my skin look and feel more hydrated and glowy which is something I always look for in foundations and this one is just a winner to me. I've done a full review of this foundation which you can find HERE. The Body Shop Frosted Cranberry Body Butter: When this scent came into The Body Shop at Christmas I made it my aim to stock up on as much as possible. I'm now on my final tub of this body butter and I'm so sad but I absolutely love it. It smells absolutely amazing and as with all body shop body butters it's so moisturizing and really works wonders for your skin. I really hope they bring it back this Christmas as it is just amazing. Bourjois Radiance Reveal Concealer: I love this concealer as it really brightens up my under eye area as well as soothes the skin underneath the eye as well as providing a lot of hydration. It's definitely one I will be repurchasing in the near future. La Roche Posay Thermal Spring Water: This is something I haven't been using a lot since I came back from Mauritius as it's been really cold in the UK however over the past week or so the weather has got dramatically warmer so I've been keeping it in my bag and spritzing it throughout the day just to give me a bit of a refresh and it has worked wonders. I absolutely love this stuff. Palmers Cocoa Butter Facial Scrub: Palmers is definitely one of my favorite skincare brands and their cocoa butter range is just incredible. This scrub does everything it says on the bottle. It exfoliates and removes all the dead and dry skin, refines it and polishes the skin leaving it really soft and smooth which I love. There is definitely a noticeable difference to your skin once you've used this so I'd highly recommend this if you love facial scrubs or looking for a new one to try. The cocoa butter scent is definitely an added bonus to this product too. I just love it. Bullet Journal: One of my favorite things to do at the moment is bullet journal. I just find that using this system to work for me makes me a lot more organised person. I love the way I can plan my time throughout this as well as make plans for other things in my life as well. It is definitely something I'm loving and I'll definitely be doing a post all about it in the future. As you can probably see I use the Leichmann dotted journal as I just think this is the best one to use as you can really tailor it to work for you. I love it. 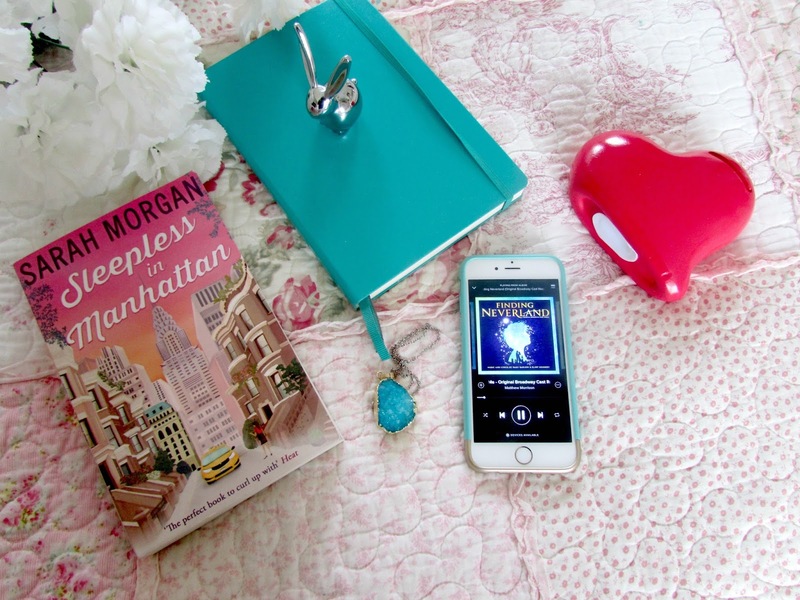 Sarah Morgan's Sleepless in Manhattan: I love a good rom-com book and this definitely hasn't disappointed. 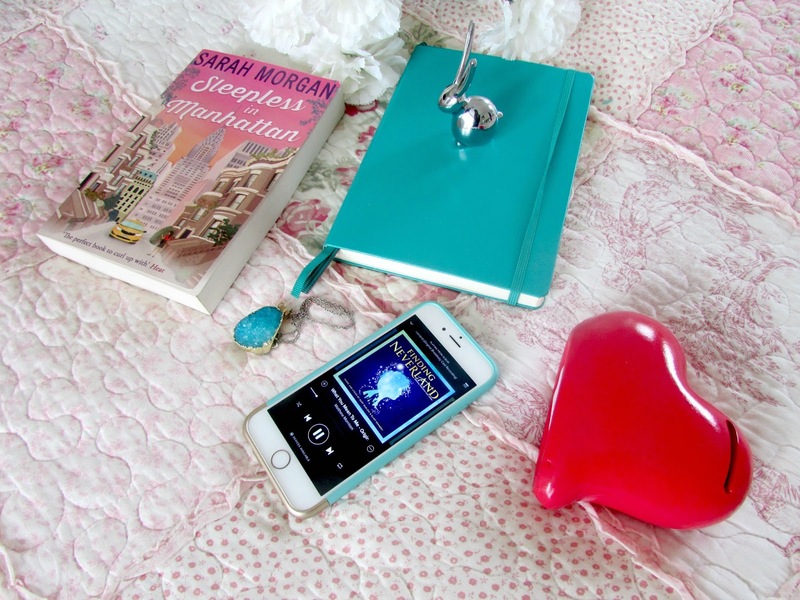 The thing that drew me in most about this book was of course the fact that it is based in New York and I love books like this as I find you really get a feel of how vibrant the city is and what it's like to be there. I love the characters of the book too. I would definitely recommend it. LVNDR Blue Crystal Necklace: LNVDR if you didn't already know is run by the lovely Em who blogs over at EmTalks. She runs this amazing online boutique that contains lots of really affordable jewelry and this gorgeous blue crystal necklace is definitely a favorite of mine. I think it's absolutely stunning and can be worn with most things in my wardrobe. It's just beautiful. Finding Neverland The Musical Soundtrack: I've been listening to this soundtrack non-stop for the past week and a half now and I absolutely love it. The music was written by Gary Barlow and the story is just absolutely stunning. It's currently on broadway till the 21st August and then will be coming to London's West End in 2017 and I cannot wait. If you haven't listened to the soundtrack yet I would highly recommend it. It's stunning. Red Heart Money Box: I was after something that could store all my loose change and was cute enough to fit nicely on my desk and I spotted this in Tiger for a couple of pounds and just had to get it as it's so cute. It's already extremely heavy though so I'm thinking another one will have to be purchased soon. Silver Bunny Ring Holder: My mum got given this as a present at work from a friend but as she doesn't really wear rings she gave it to me and I absolutely love it. It's so cute and looks really nice with all my different rings stacked up on the ears. I absolutely love it. So there we have just a few of my favorite things at the moment. I thoroughly enjoyed writing this post and I love reading favorites posts like this as I always get ideas for a new product to try or something else to buy that I don't have. Are there any things here that you're also loving? 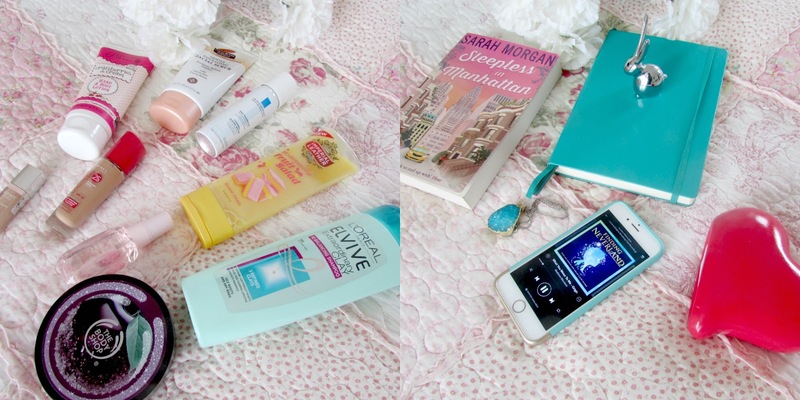 What are your favorite things at the moment? Great list! That fruit salad shower gel sounds heavenly. I'm a big fan of fruity and sweet scents too.